It's Back!!! FRESH 13.85oz glass bottles of Lemmy Strawberry Lemonade WITH PURE CANE SUGAR!!! For the first time since the 1950s Lemmy Lemonade has been brought back to life for a new generation of soda pop enthusiasts to enjoy and for the older crowd to reminisce about the good ole days!! Lemmy Lemonade was first introduced in 1939 and was produced by the A.J. Lehman Company and contained real lemon juice. This updated version also contains lemon juice. 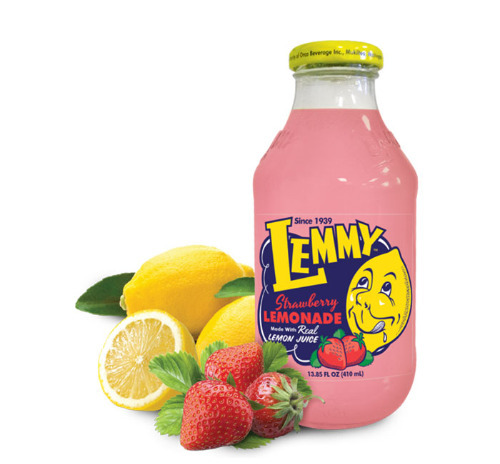 For the taste of fresh squeezed lemons, just say "Lemme have a Lemmy".